Ukiyo-e Search provides an incredible resource: the ability to run a reverse image search for Japanese woodblock prints and the ability to see similar prints across multiple collections at once. Over 220,000 prints and metadata have been aggregated from a variety of museums, universities, libraries, auction houses and dealers from around the world. The image and text search engine allows multiple copies of the same print to automatically line up with each other and are made viewable in a gallery for easy comparison. The entire website is also available in both English and Japanese. Ukiyo-e.org was created by John Resig, a computer programmer and avid enthusiast of Japanese woodblock prints who recently become a Visiting Researcher at Ritsumeikan University in Kyoto. This powerful tool is used frequently by UChicago faculty and aided the cataloging of several albums in the Smart Museum’s collection. The exhibition brings together many of the most influential works in abstraction’s early history and covers a wide range of artistic production, including paintings, drawings, books, sculptures, films, photographs, sound poems, atonal music, and non-narrative dance, to draw a cross-media portrait of these watershed years. In the October, ARTnews reported that the Leah Dickerman, curator of the exhibition, was collaborating with Paul Ingram of Columbia University’s business school because he specializes in social network analysis. Dickerman wanted to visually display connections and friendships among the artists and creators involved in the genesis of abstraction, and she and her team, along with their business school partners, began mapping connections in an Excel spreadsheet. The project then turned into a dynamic network of artists and other creative types connected by vectors. They liken the project to a Facebook or LinkedIn network for the abstract vanguard. In the ARTnews article, Paul Ingram “explains that the quality of ‘between-ness’ in the network—being on multiple paths between others—is associated with creativity. According to this measure, he says, Kandinsky is the most central figure in MoMA’s history of abstraction.” The interactive chart highlights key players in red, and for each artist represented on the chart, more information about their role, interests, and works is provided. And as an aside, the ARTnews article mentions several other charts or family trees that had been created to document relationships (either sincerely or snarkily) in modern art movements—be sure to check out the very famous Barr’s Chart! These genealogical charts differ greatly from the social vectors described in the new MoMA chart, but provided the initial inspiration for the website’s diagram. Another “genealogical” example comes from the Irving Penn Archives, housed at the Art Institute of Chicago: Penn drew an a family tree, titled “An Immodest Claim to Artistic Roots,” in which he lists several of the artists included in MoMA’s Inventing Abstraction exhibition including Fernand Léger, El Lissitzky, and Man Ray. You can view his tree here. The VRC will be adding images from the exhibition to our LUNA collection soon! The Developing Room is a working group devoted to the study and practice of photography. Founded in 2008, the Developing Room is based at Rutgers, the State University of New Jersey. Our mission is to promote innovative work in the field of photography studies by organizing public projects and fostering international collaboration. Click here for more information about this group. The Tibetan and Himalayan Library (THL) collections of images are indexed by THL’s Place Dictionary and Knowledge Maps for easy exploration. View over 60,000 photos of Tibet and the Himalayas, many with links to maps. The Tibetan and Himalayan Library is a publisher of websites, information services, and networking facilities relating to the Tibetan plateau and southern Himalayan regions. THL promotes the integration of knowledge and community across the divides of academic disciplines, the historical and the contemporary, the religious and the secular, the global and the local. Images are linked together by topic, location, and collection for easy browsing and context. For more information, see the library’s main site. Facebook does allow some selective sharing, but doing so is difficult to master. As a result, many professors have decided to reserve Facebook for personal communications rather than use it for teaching and research… In Google Plus, users can assign each new contact to a “circle” and can create as many circles as they like. Each time they post an update, they can easily select which circles get to see it. See also an article from journalism professor Jeremy Littau on “Why Lehigh (and every other) University needs to be on Gplus. Now.” His explanation includes a plan to hold virtual office hours using the Google+ Hangout feature. Via Access to Mideast and Islamic Resources (AMIR). The Photography, Video and Visual Journalism blog for the New York Times, Lens, has revealed their interactive mosaic of photographs which were solicited on Sunday, May 2nd, from readers around the world. The mosaic takes shape as a globe covered with stacks of the digital photographs, corresponding in location to where they were captured at a single moment in time. 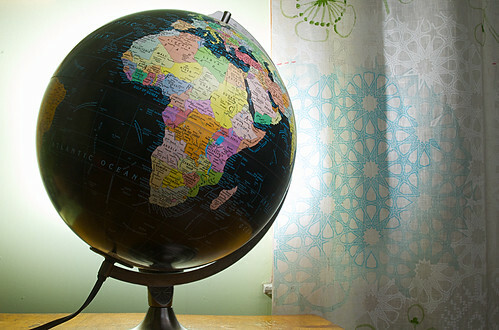 The globe can be “spun” in any direction to explore various locations, and pictures can be searched by topic: community, arts and entertainment, family, money and the economy, nature and the environment, play, religion, social issues or work. Image-specific URLs are also available so that you can return to your favorite photographs again and again. Where will you be on Sunday, May 2, at 3pm? Wherever you are, we hope you’ll have a camera — or a camera phone — in hand. And we hope you’ll be taking a picture to send to Lens that will capture this singular instant in whatever way you think would add to a marvelous global mosaic; a Web-built image of one moment in time across the world. Read more about this project on Lens, the Photography, Video and Visual Journalism blog for the New York Times. Submit your photographs here (link will be active after 15:00 on May 2nd). In 2006, the Met, MoMA, the Brooklyn Museum, and the Frick Collection teamed up to create NYARC: the New York Art Resources Consortium, a system which unites the resources and libraries of these institutions and makes them more accessible to both scholars and the general public. Funded by the Andrew W. Mellon Foundation, NYARC seeks to extend library and archive resources, services, and programming to a wider audience, and to facilitate collaboration between leading art research institutions. Through NYARC’s website you can access the 800,000-record ARCADE database, which serves as a cohesive online source for the combined holdings of the Frick, MoMA, and the Brooklyn Museum. There is also a portal for WATSONLINE, the online catalog for the Museum of Modern Art. Finally, links to news posts alert you to current projects like the JSTOR Auction Catalog Pilot Project and new holdings in the NYARC museums. To view the New York Times’ profile of NYARC, refer to this article from March 14th, 2010. This blog post was contributed by student staff member Emilia Mickevicius.